I have highlighted the ideas that I will focus on. Fischer is saying that the current Fed nominal rate is just below the neutral nominal rate. I agree. 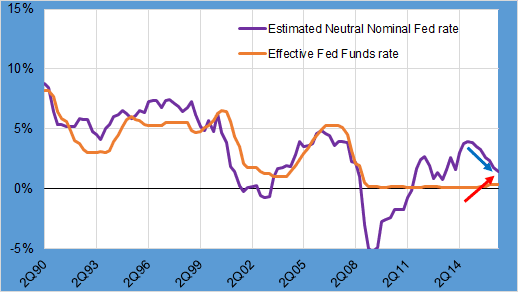 However, the neutral nominal rate has been falling. It appears he thinks it is rising. Here is a graph explaining what I mean. The orange line shows the actual Effective Fed rate. The violet line shows my estimate of the neutral nominal rate according to the business profit cycle of effective demand. The graph shows my estimate a bit above the actual Fed rate, but it is trending downward (falling blue arrow). Fischer also estimates that the neutral rate is a bit above the current Fed rate, so he says that monetary policy is modestly accommodative. However, he believes that the neutral nominal rate is rising (rising red arrow) because he says there is little risk of falling behind the curve. One of us sees the curve upside-down and I believe it is he. He sees the curve going up, while I see it going down. The business cycle is showing signs of coming to an end. Profits are coming down for over a year. Unemployment is flat-lining. Auto sales have peaked. Year-over-year change in non-farm employment is trending down. There are more signals that the business cycle is decaying into a contraction. Fischer believes that the Fed rate can rise safely at some point. But from my point of view, any rise in the Fed rate will bump against a falling nominal neutral rate. The Fed has been behind the curve for years and did not know it, basically because they do not have a grasp of potential GDP. Here is my estimation of the Real output gap against the CBO’s. 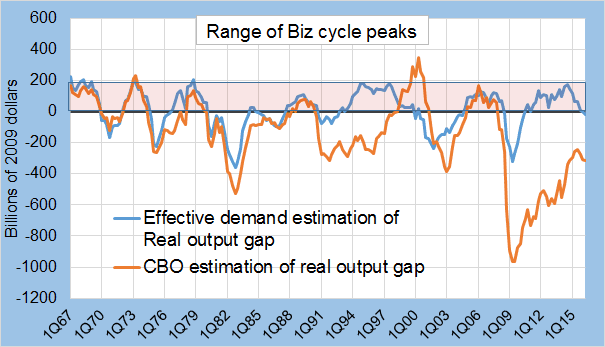 My estimation is based on comparing an effective labor share number against capacity utilization, which is optimized when the business cycle reaches its peak. Capacity utilization has alreacy been optimized in this business cycle. The CBO sees real GDP still about $300 billion below potential. They see the curve still rising. Whereas I see that the output gap has already gone through a normal business cycle peak shown in the rose-highlighted area. I see the output gap already falling toward a contraction. Therefore, I see the curve going down. The Fed should not raise the Fed rate. Monetary policy will tighten on its own as the business cycle further decays over time.